Home News Tech Cicret Band : A Wearable Phone. Cicret Band : A Wearable Phone. Imagine a Band in your hand Performing most of the operation a phone performs like Playing games, setting alarm, reminders ,Texting, finding a Place(GPS), Watching Videos and many more stuff. It is a wearable device that can pair or link with a smart phone / tablet, and can do projection, sensing, and short-range data transmission.You can manipulate the image which this band is going to project on your hand. Cicret band is ready to follow your commands in little span of time. Price of this wearable is considered between $450 to $500. Proximity sensor will throw electromagnetic radiation over the screen or image on your hand creating a field and when we enter our finger to touch and that is detected by one of the Proximity sensors out of Eight and then it sends signal to the phone/tablet and follows command. In todays date, where technology plays an important part of our lives. 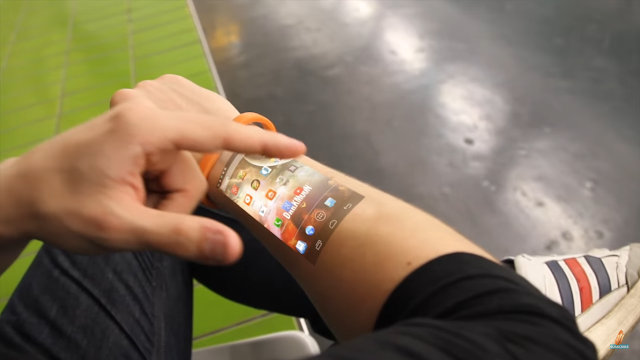 And as technology is getting advanced day by day, surely such wearable phones will take over our smartphones soon. But would you like to get one of yourself? or would you stick to smartphones ? Let us know in the comment section below.